Every summer, we invite change-makers from across China—the Good Food Heroes—to share their project ideas at the Summit and receive mentorship from global leaders to practically promote research and action towards a sustainable food system in China and beyond. The theme of the Good Food Hero Summit 2018 is “Menus for the Future”—how public institutions can establish and implement a mindful food policy to lead the food system towards a healthy and sustainable future. Good Food Fund and Brighter Green are working to bring together the best resources from different continents to elaborate on sustainable food concepts as well as the establishment and implementation of effective food policies, together with visionary school managers, students, and other change-makers in public food services. The summit will comprise of speakers from world-level academic and professional backgrounds, workshops with these experts to discuss and elaborate on project ideas, and forums for these ideas to be shared. A list of the speakers and their bios can be found here. 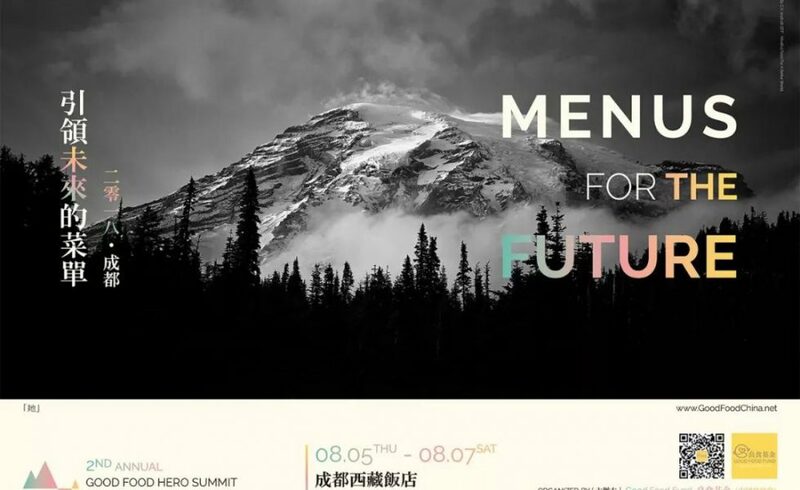 This is the Second Annual Good Food Hero Summit, taking place August 5th—7th in Chengdu, China. Information about the first Summit can be found here. Approved by the State Council, registered in the Ministry of Civil Affairs, and supervised by the China Association for Science and Technology, the China Biodiversity Conservation and Green Development Foundation (CBCGDF, or GDF) is a nationwide non-profit public foundation and social legal entity dedicated to biodiversity conservation and green development. GDF’s mission is to raise awareness and facilitate action at all levels of the society to support biodiversity conservation and green development, preserve resources of national strategic value, provide guidance to sustainable socio-economic development, promote the implementation of the concept of ecological civilization. The Good Food Fund under the GDF focuses on research, communications, policy advocacy, events, public education, and incubating entrepreneurship related to the food system. It aims to facilitate shifts in food production, distribution, and consumption patterns towards a healthier, more environmentally friendly, and more sustainable food system.